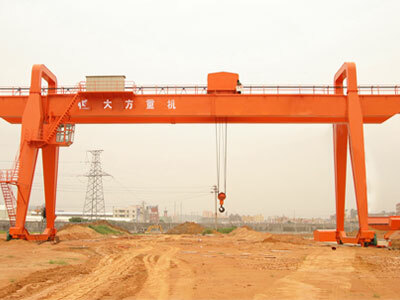 MG double girder gantry crane is a typical A frame crane designed for general lifting purposes. It can be employed for outdoor heavy duty lifting applications, such as freight yard, construction site, railroad terminals, shipyard and port. 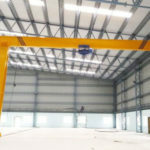 The double beam gantry crane can also be used inside your facilities to perform the light lifting work. 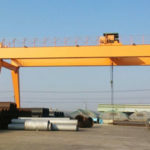 The MG type gantry crane is the most commonly used gantry lifting equipment for its high utilization, wide application, great adaptability and strong versatility. The rated lifting capacity ranges from 5 tons to 320 tons. The double girder crane can support far more weight than its single girder counterpart, and it is able to cover large working areas. It works efficiently in the workplaces and makes the lifting effortless and convenient. The double girder cranes operate electrically, so they are good for the environment. 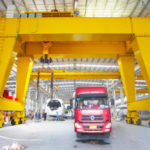 A number of safety devices can be fitted to gantry cranes to make sure the lifting operation is safe and efficient. 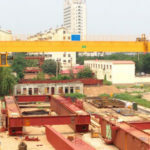 Our gantry cranes are built with long working life and reliable performance. The MG double girder gantry crane offers great flexibility in design to fit a range of working occasions. It is also available in custom design to meet the special requirements of customers. The double girder gantry cranes mainly consist of the gantry frame, hoist trolley, crane travelling mechanism and electrical system. 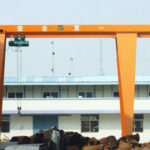 Gantry frame – it is the basic unit of gantry crane, which is composed of the upper main beam, end beam, supporting legs, the lower end carriages and cabin. In regards to the design of cantilever, the metal structure can be built with one cantilever, two cantilevers or no cantilever at the end of main beam. Hoist trolley – it consists of hoisting mechanism that lifts and lowers loads rapidly and a trolley that carries the hoist to move horizontally along the bridge girders. The design of a hoisting mechanism is largely determined by the rated load weight, work duty, lifting height and speed. 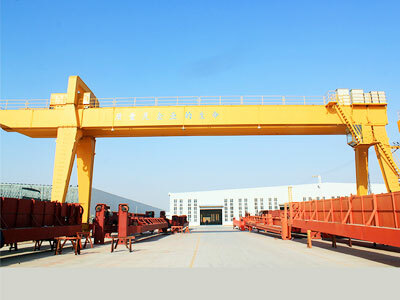 When the lifting capacity is more than 10 tons, the double beam gantry crane is more often equipped with two sets of lifting mechanisms, that is, the main and auxiliary hoisting mechanisms. The former performs the main lifting work, and the latter is used to lift lighter loads or do auxiliary work so as to improve working efficiency. 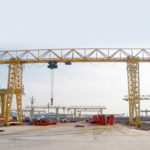 Crane travelling mechanism – the MG double girder gantry crane is limited to travelling on rails, and it can be designed to accommodate a variety of rail configurations. The steel wheels provide the possibilities of supporting a substantial amount of weight. 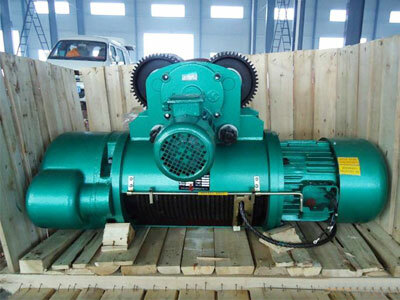 Electrical system – the double girder crane can be powered by cable reel, diesel generator or bare copper slip line. Control system – this type of crane can be controlled from a permanent cabin or remotely controlled with a handheld button box. With respect to the lifting capacity, working environment, ease of use and safety precautions, each control way has its own advantages and disadvantages. You can choose either way to control the movement of the crane or the combination of the two methods. 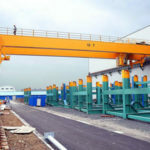 The double girder gantry crane is meant to lift small to large loads inside the facility or outdoors, such as storage yard, workshop, warehouse, construction site, railway and port. It can be put into use for frequent or continuous working. The ambient temperature will go up to 40℃. 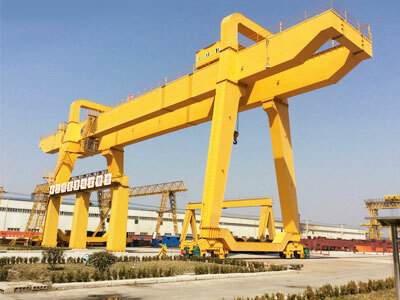 As one of reputable double girder gantry crane manufacturers in China, Dafang company provides a range of lifting equipment for your individual applications. 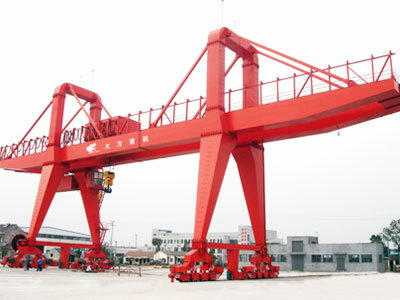 To know more about double girder gantry crane, contact us today!